Draper Easels stand rock-solid on wobble-proof legs, fold easily for transport or storage. Numerous exclusive features insure effective, trouble-free visual presentations time after time. Draper offers the largest selection of paper pad, dry-erase, poster and decorative display easels in the world. 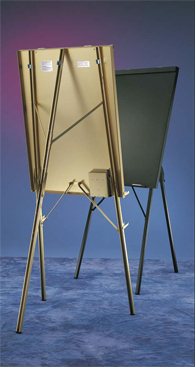 From heavy duty models to decorative poster units, Draper offers easels for every situation. Careful attention to quality, function and appearance, plus an expanded range of decorative finishes, make Draper the world�s premier line of professional easels. In paper pad and writing surface easels, Draper offers two separate standards�DR Series and OP Series. Both are carefully assembled of highest quality components with all-riveted construction. Draper Easels�for effective visual presentations.